Based on historical fact, this feast of a book, the first illustrator Lynch has authored as well, will captivate readers from its opening double-page spread...What sets this book apart from myriad Pilgrim stories is Howland's personal point of view, which helps readers enter into the tenor of the time, when the settlers' religious faith both motivated and sustained them, and the dramatic illustrations with their expert play of expression, composition, and light.Sweeping and grand, this personal take on a familiar story is an engaging success. Lynch’s meticulous watercolor and gouache illustrations imbue the pages with cinematic energy. The opening birds-eye view of bustling 1620s London allows careful readers to spot a tiny Howland running through muddy streets on a clandestine errand; a later spread shows the Native Americans’ vantage from shadowy woods as they secretly watch the newly arrived Pilgrims. Short chapters with straightforward titles chronologically segment a familiar story that has been personalized through stunning artwork and insightful storytelling. The clearly written, first- person account, told from John’s point of view, combines history with adventure and a hint of romance. Based on historical sources, the narrative is laced with well-imagined characterizations and conversations. The book’s wide format showcases Lynch’s dramatic and richly atmospheric watercolor and gouache paintings, which include strong individual character portrayals as well as beautifully composed scenes on land and at sea. This handsome volume offers a dramatic personal story of the Pilgrim’s voyage on the Mayflower and their early experiences in America. Coupled with richly detailed and often dramatic watercolor and gouache illustrations, Lynch’s fast-paced text brings a new excitement to the Thanksgiving story. An excellent choice for teachers seeking a new approach to the history of the Pilgrims. Enhanced by a large format that showcases Lynch’s striking watercolor and gouache illustrations, this fictionalized account of Howland’s story will spark young readers’ interest in learning more about the Wampanaog and English people who encountered one another so long ago. Howland’s voice is vibrant and convincing, and Lynch deftly integrates information known about Howland’s future...Lynch’s wa- tercolor paintings harken back to the dramatically composed and illuminated work of N. C. Wyeth. 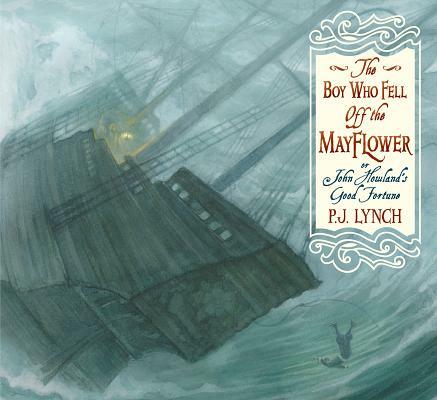 P. J. Lynch has written a compelling accounting of young John Howland’s story and the larger story of the Mayflower. The writing is crisp, and the facts are presented in captivating prose. The rich, detailed paintings he uses to illustrate his story evoke times past and steep the readers in Howland’s journey. This is one of the finest middle-grade historical picture books available. Don’t miss it. This handsomely illustrated volume breathes life into the familiar Pilgrim story by narrating it from the point of view of John Howland, a young man who was indentured to first Plymouth governor, John Carver...Watercolor and gouache illustrations enhance the storytelling.